As everyone knows, men’s and women’s brains work very differently. Generally speaking, the feminine mind tends to have a constant inner dialogue of, “Do I feel loved, or do I not feel loved?” This is often operating even if a woman isn’t aware of it. That’s not how men operate. The masculine mind tends to have an inner dialogue of, “Am I winning, or am I losing?” That’s why men love sports and following stocks, because it’s clear-cut and easy to figure out who’s winning and who’s losing. It aligns well with their brains. This is also how men primarily process love – that’s their first filter. When men feel like they’re winning, they feel like they’re “loved” by the world – even if it isn’t always true, that’s generally how they think about things. They feel like they’re lovable BECAUSE they’re winning. When it comes to dating and relationships, men need to feel that they can “win” with you, especially in the beginning. Appealing to their sense of “victory” will make you irresistible to men! If you present yourself in such a way (or your online dating profile is written in such a way) where men feel like they could never “win” with you – they either won’t reach to you in the first place, or they’ll try for a little while but eventually give up. Even if a man sees you as the “total package” – if you give off the impression that you’ve seen it all and done it all, or if you’re cynical or jaded – a man is going to feel like there’s “nowhere to go” with you. There’s no “victory” there. Before I figured this out, I was doing this for YEARS and pushing men away without even realizing it! What you want to do instead is LET a man impress you and win you over! 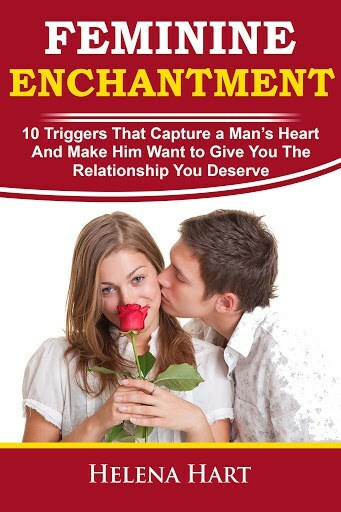 In fact, Letting Him Impress You is one of the Attraction Builders in my eBook, “Attract The Man You Want.” It helps to build intimacy and the kind of deep attraction that inspires a man’s love, affection, and life-long commitment. All men desire to be respected, admired, and appreciated. They CRAVE this respect. They want to be good protectors and providers – that’s often their main focus. When a man feels respected, admired, and appreciated – that’s when he can REALLY fall in love. What’s so special about being a woman in a man’s life is that when you’re in your feminine energy and letting him impress you, you’re the only thing he doesn’t have to compete with – he just gets to love and adore you!